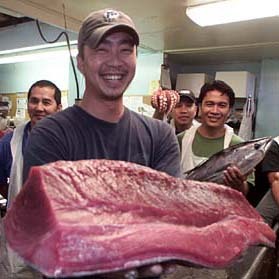 Some of the people in the seafood department at Tanioka's Seafood and Catering display their stock. The family-run Waipahu company celebrated its 25th anniversary this year. »Holoholo Honolulu: Nippu Jiji Bldg.